I first saw this painting in the MOMA. It is almost 6 feet, 5 inches tall. It is impressive. I did not study Art nor do not have an art background. But I believe the best art makes you think. It provokes an idea that stays with you. It scares you. It makes you happy. It makes you believe. It makes you human. Anyone can appreciate art, it is a personal thing. Who is to say one is better than the other? The main thing is that it means something to you — the artist within. Yves Klein once said of monochrome painting that they are an “open window to freedom.” I agree. Klein painted this in 1961, the year I was born. This is my “open window.” I hope you like it. If not, that isn’t a problem either. 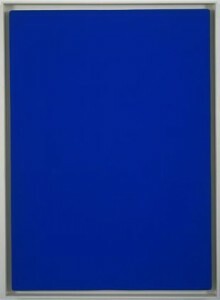 For more information on Klein’s work, please see the info on Artsy.